1. Galaxy Formation and Evolution. In particular early-type galaxies, galaxies in clusters, and high redshift galaxies. Examples of my research can be found here. 2. Co-evolution of spheroids and black-holes. Check out the AMUSE-Virgo website. 3. 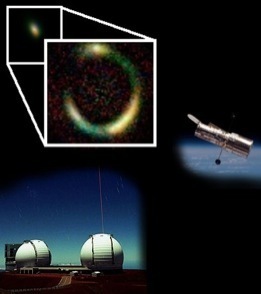 Gravitational Lensing and dark matter in galaxies and clusters of galaxies. Examples of my research can be found on the webpages of the LSD and SLACS projects. 4. Cosmography from gravitational time delays, more details can be found here, and here. 5. Galaxies at the epoch of reionization, more details can be found here. We meet every week to eat pizza and discuss our research on gravitational lensing, galaxy evolution and black holes according to this schedule. If you are interested in attending please e-mail me or Daniel Gilman ( gilmanda AT g.ucla.edu). If you are looking for a PhD Thesis there are plenty of cool projects to work on. E-mail me if interested. If you are a PhD Student abroad and you are interested in a visiting position in my group at UCLA feel free to contact me.